José Mourinho snapped at the media and walked out of a wild and chaotic press conference on Monday evening. The Manchester United manager had just watched his team lose 3-0 to Tottenham Hotspur. He praised the team and his club’s supporters, fumed at media coverage which he claims is too negative, then stormed off while demanding respect. José Mourinho snapped at the media and stormed out of a wild and chaotic press conference after his side, Manchester United, got humbled by Tottenham Hotspur in a 3-0 loss on Monday. One goal from Spurs striker Harry Kane and two from winger Lucas Moura helped inflict the heaviest defeat Mourinho has ever suffered at a home ground as a manager – but rather than concentrate on the loss, Mourinho wanted to trumpet his past achievements. 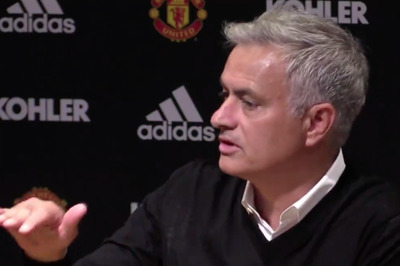 The United boss angrily held up three fingers in the post-match press conference – one for each Premier League championship he had won – and demanded that journalists present in the room show him “respect.” He accused them of unfairly chastising him for a poor performance against Tottenham, and claimed his team had pulled off a “miracle,” despite the loss. Mourinho then claimed that regardless of a win or a loss, reporters always put a negative slant on the game. He said they’re “not happy” when he wins, and even more critical when he loses. He praised his team, the club’s supporters, and then angrily left the room mid-interview. "And I won three PL titles, more than any of the other 19 managers. Respect, please"